Another Taipei post only three months after the fact! Must be some sort of new record for speediest travel post. 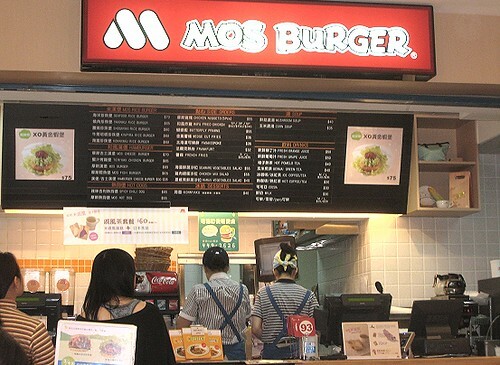 MOS Burger is a fast food chain originating from Japan. The first time I saw one during the trip, it was a very small kiosk in a metro station. They didn't seem to have a menu with any descriptions that time, so I didn't know what was going on and decided to get food from a different place. But, we happened to see another location again some time after that and seeing this poster, we felt we could make somewhat "educated" choices. MOS is probably famous for their Rice Burger, so we definitely had to order one. 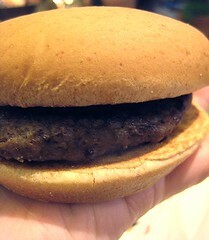 For our other combo meal, we decided to test their plain hamburger. The combo comes with a drink and a choice of some other item. 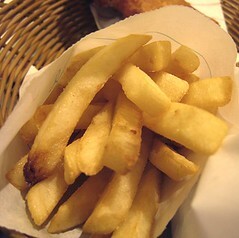 We chose fries. The burger was quite small, viewed from a North American point of view. Not sure if it's detectible from the photo above, but it fit nicely within the palm of my hand. 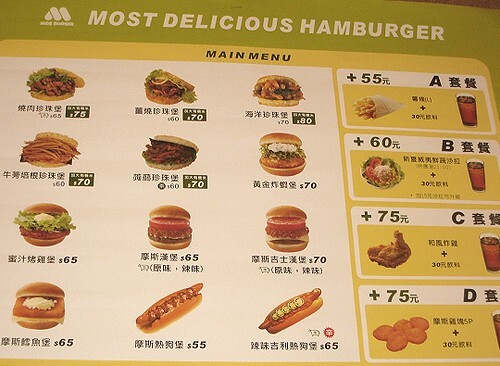 Also, we weren't sure, but the patty may have been made from a combination of ground beef and pork. Teehee, I think it's just me, but I really got a kick out of the packet above. For our other fries + something combo, we chose the fried chicken breast. 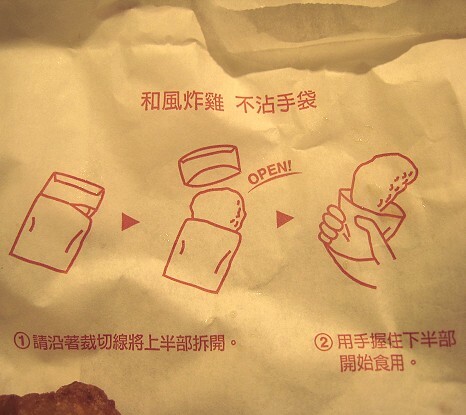 Those instructions were for how to use the wrapper to hold your chicken so you don't have to mess up your hands. 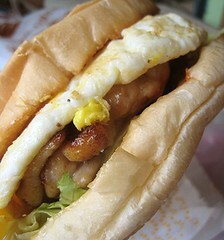 Finally, the Rice Burger. 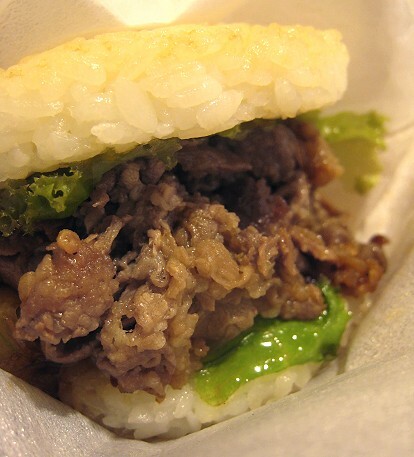 We chose the Yakiniku Rice Burger (grilled beef strips). 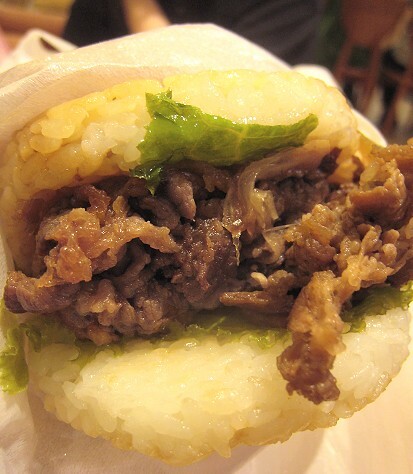 As one may have gathered from the name, the "bun" is made from rice. This was actually quite good. To put it simply, it's like eating sukiyaki beef over rice (very nice), but in a portable form! On our way to the National Palace Museum (an excellent museum, by the way), we decided to grab something to eat for breakfast. However, it seemed that Taipei doesn't wake up until 11am! 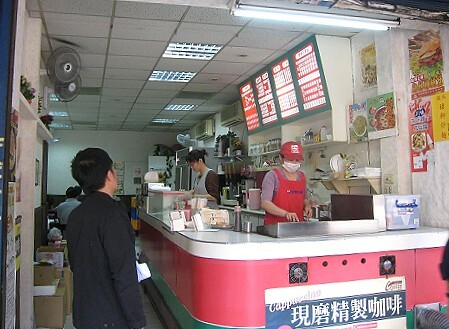 It's very difficult to find anyplace open at the late morning hour of 10am, let alone earlier. The only place we could find was a Taiwanese bakery, but I wasn't in the mood for it. 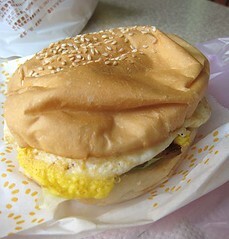 JS bought a pork floss bun, but I wanted something else. Good thing we walked past Hong Ya. As there were a few people who were ordering from the counter, I figured this was a safe bet. It was a little bit of a challenge ordering as the menu was in Chinese. 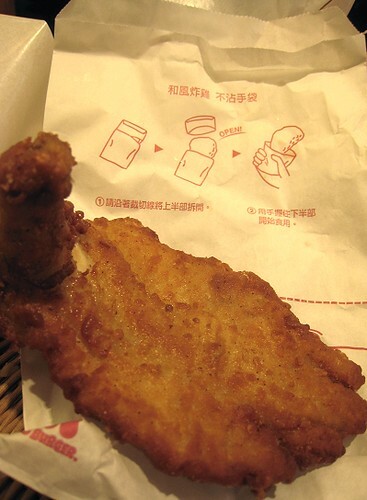 I could tell that a certain item was "chicken", for example, but could discern nothing else. 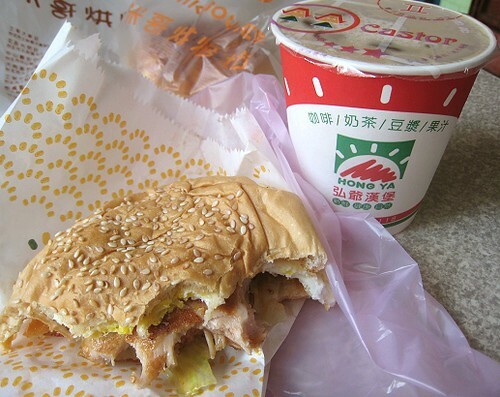 So, I pointed to a "chicken" bun item on a fairly large poster. The woman asked if I wanted an egg in it. Oooooh, I certainly did. Don't be fooled by its homely appearance. This was actually quite good; it definitely hit the spot. The reason: this was "real" food, unlike fast food in North America. 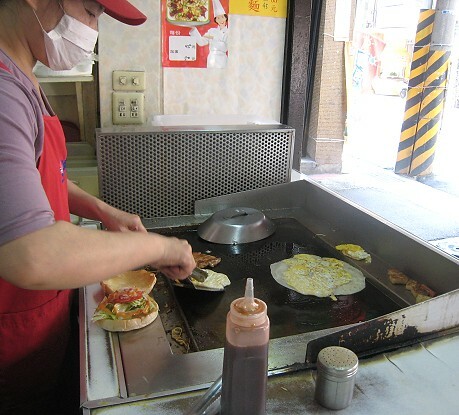 There is my real marinated chicken on the griddle, beside my fried egg. Sorry for the partially eaten sandwich there. I just realized I didn't get a shot of my meal. It came with an iced coffee drink (nothing to write home about). There in the background is JS' pork floss bun. We were walking around the Xi Men Ding (西門町) pedestrian area one evening, full from a very late "lunch"/mid-afternoon snack (of beef noodle soup), and whiling away some time before meeting cousins for dinner (at Din Tai Fung), when we saw the scene above. 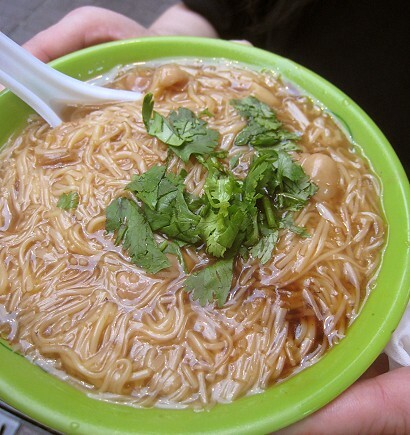 There were a bunch of people just loitering the streets, eating some sort of noodle dish. We didn't think much of it, seeing as we didn't really have any room for food. However, we passed by once again after forty-five minutes or so, and, seeing that there were still a lot of people enjoying their noodles, I decided to get one. Flour-rice noodles turned out to be a type of misua noodles. 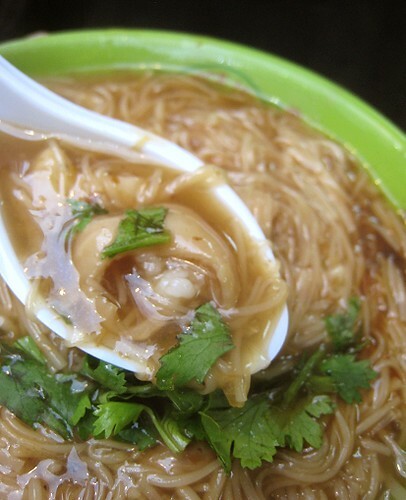 After a quick look on Wikipedia, I assume that this is the "brown" misua, and my bowl is one of oyster "vermicelli" (or more accurately, oyster noodle threads). 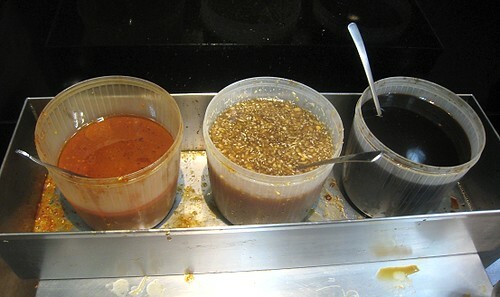 There were three condiments available: a chili thing, a garlicky thing, and I don't quite remember the third one... could it be soy sauce-based? Or vinegar? I simply added a bit of each. So, was that crowd warranted? Well, I thought the dish was "OK" (not bad), but I didn't feel a special affinity for it. Frankly, though, I don't remember much about it. 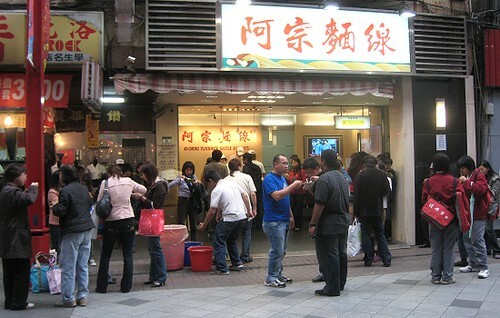 Perhaps there was just such a crowd because Ay-Chung uses real bowls, so customers had to eat it right there. 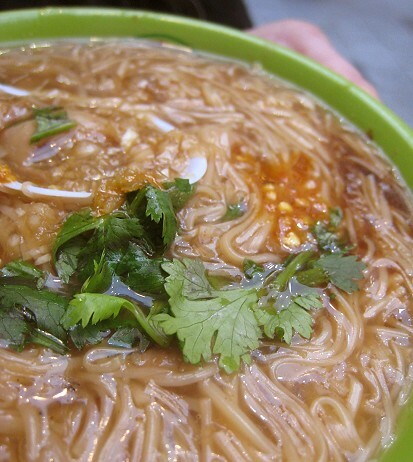 I turned to my friend AL (whose wedding it was that I attended in Taipei) and asked for more information about this "flour-rice noodle" dish. She, in turn, although already having the said information, had it confirmed by her mother! AL said that when she asked her mother about it, her mother was very vague and then countered with, "Why do you want to know?" AL explained I was asking, in which case, her mother replied: "Oh, then in that case, this and this and blah blah blah goes in..."
Apparently, the stock is each restaurant's secret. For this dish, small oysters are key (not humongous ones) and at times, pork intestines are also added. Oh, fyi, according to AL, Ay Chung is definitely not a good place to get this oyster/pork intestine noodle threads dish. Reading this makes me want to hop a plane and eat my way through asia! Mmmmmm love Asian fast food. Though I have to agree on the size of mos burgers. I think they may have invented the idea of a "slider". Not enough to get full off of. 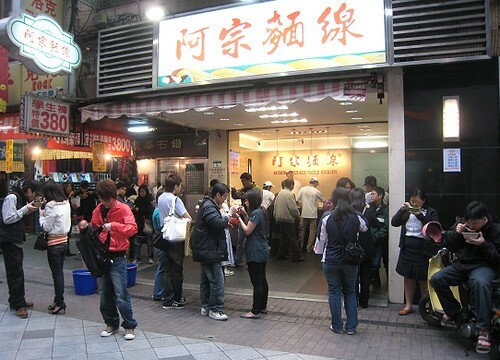 For oyster vermicelli, there's a place in Taipei where people will lineup, get their bowl, and go lineup again while eating their first bowl...that's how good it is! I think it's a street stand though, not an actual restaurant? Not sure, I'll have to ask my mom about it. I know it's weird, but did you try any burgers at McDonald? The Spicy Chicken burger they have is soooooooo good, and they also had a rice patty burger but I didn't try it, and I regret it now! As for breakfast, there are places open early! Savoury soy milk + pastries...mmm yum. Yeah... but I guess that prevents us with no self-discipline to control our portions. Hehe. This was the trip where we couldn't find a McDonald's when we wanted to! I guess they aren't totally *everywhere* there. Yeah, it's so hard finding these good places to eat without a trusted source!